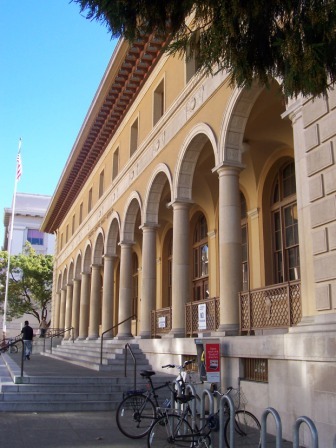 While Measure J - "Save the Landmarks Preservation Ordinance" - did not pass in Election 2006, the City of Berkeley hosts remarkable buildings, some landmarked, others not (see the City of Berkeley, Designated Landmarks document). 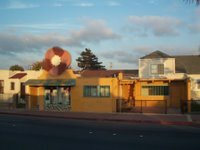 For example, Celia's Mexican Restaurant, described by John King as an "utterly nondescript building," received landmark designation while neighboring Brennan's Restaurant did not (read King's article as well as Patrick Hoge's article, both in the SF Chronicle. The Davis-Byrne building on Dwight Way between Shattuck and Fulton was designated a landmark in 1991. 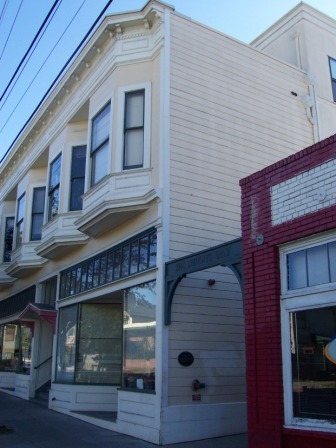 It was built in 1895 as a mixed-use building (commercial on the ground floor and residential on the second floor) as part of a commercial district supporting the Dwight Way Station at Shattuck Avenue. The train line ended at the California School for the Deaf and Blind (landmarked and currently the UC Clark Kerr campus). The building was remodeled by George L. Mohr. 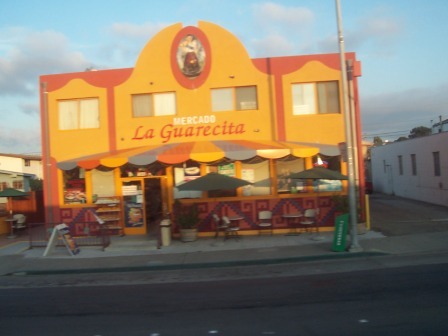 It remains a mixed-use building, part of a thriving block-level commercial district including Mushashi (Japanese restaurant), Vyew.com (web conferencing software), Henry Chin's Auto Care, U.C. Glass Co., and B-side Records. Another landmark with a UC connection is the Woodworth house built in 1905 and located on Carleton Street. 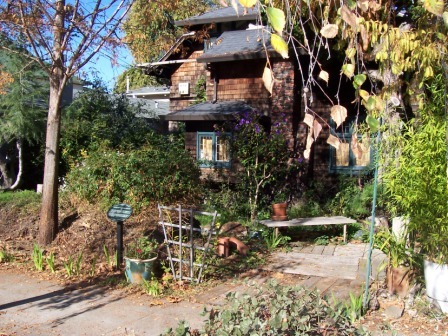 The owner, Charles Woodworth, a UC professor of entymology, designed the house and was also involved in the founding the first public library in Berkeley. The First Church of Christ Scientist on Dwight Way was given local and national landmark status in 1975 and 1977 respectively. The building received the most votes in a contest sponsored by the American Express Partners in Preservation including the National Historic Preservation Trust (see the Daily Planet article). A "Saving America's Treasures" matching grant is funding the current roof reconstruction (see photo). The church was designed by Bernard Maybeck in 1910 and construction was completed in 1911. 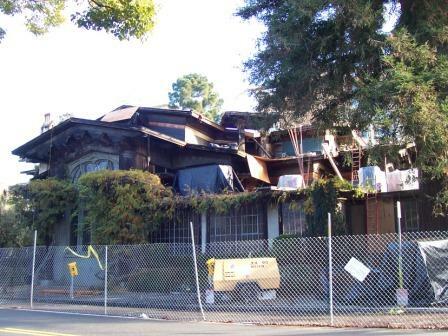 Additional information about the preservation campaign is available at the Friends of First Church Berkeley website. Resources for regional architecture include The Living New Deal Project developed by Gray Brechin (author of Imperial San Francisco) and the New Deal Network (see below). Among the many items associated with the holidays are the lists...of groceries, of gifts, of recipes, the to-do list, and the airport-pickup list. In the spirit of list-making, this post considers several types of lists. The first list is not a list in the traditional sense. 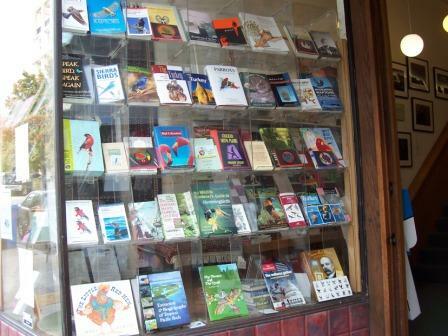 It is a bookstore window display. 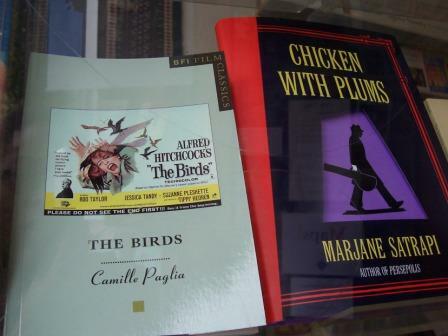 The theme of the display is bird books, thus constituting a graphic list as opposed to a textual, itemized list. The display is also appropo of the Thanksgiving holiday for which the turkey is the main ingredient. 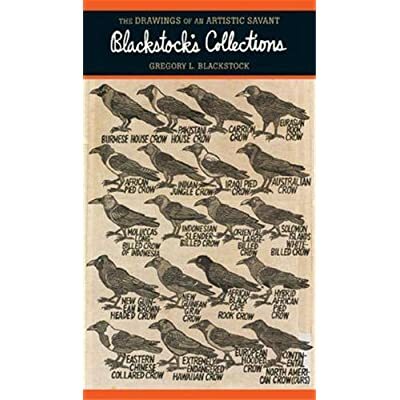 Another list is Blackstock's Collections by Gregory Blackstock. Each page in the book is a graphic collection of thematic items. The larger themes are Our Famous Birds, Fish & The Like, The Dogs, Insects & Arachnids, The Plants, The Tools, The Noisemakers, and The Vehicles. Great turkeys and world crows are two of the birds featured in Our Famous Birds. A more traditional list is the book list. 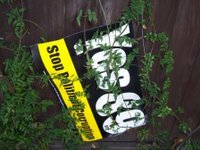 local ecologist has such a list available through LibraryThing. I came across a book list in the Nov. 13 issue of The New Yorker. It was not a purposeful list, but the books referenced in Packer's article on Lagos, Nigeria would make a great reading list for a univresity course in development or planning. A Santa Fe passenger train (also known as Atchison, Topeka, and Santa Fe Railroad). This image is circa 1895, available from answers.com, and is in the public domain. 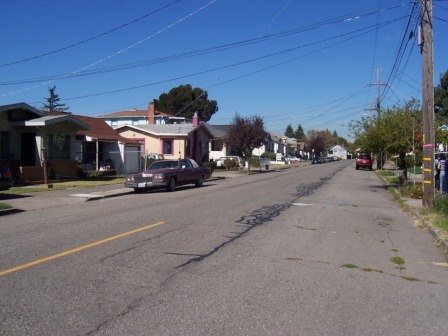 The Santa Fe Right of Way in Berkeley runs between Oregon Street at Sacramento Street and Cedar Street at Juanita Way. 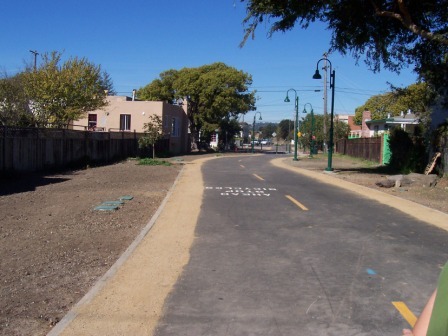 At Cedar, the Santa Fe ROW joins up with the Ohlone Greenway. Ohlone Greenway is located in the cities of Albany and El Cerrito. This portion of the right of way was converted to elevated BART tracks and the ground rights were transformed to parkland in the early 1970s. 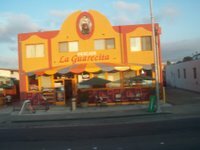 I think the Emeryville portion of the Santa Fe ROW is now a bicycle trail. There is no comprehensive plan for the 3.2-mile Berkeley portion but several parcel projects have been developed and are proposed. 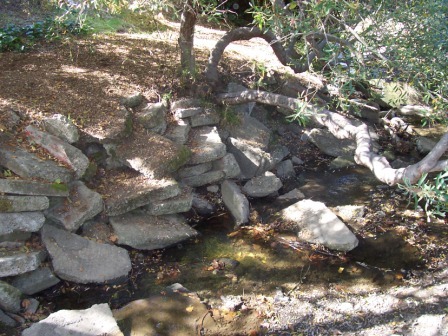 On October 18, 2006, I went on a guided walk given by Susan Schwartz of the Friends of Five Creeks and the Berkeley Path Wanderers Association. The following photographs and notes are highlights from the walk. 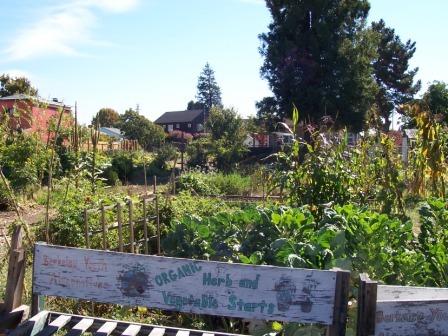 The Spiral Gardens community garden, Oregon at Sacramento - this community garden is not divided into individual plots. 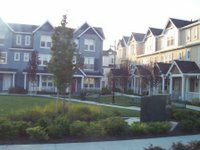 McDuffy Development, Oregon at Dohr - a modest, working-class development. One of two proposed orchard sites, between Ward/Derby, Derby/Carleton - these are 40-foot lots. 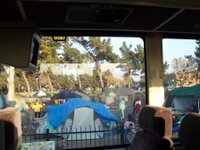 Ongoing debates are about fencing and access as well as the 12-foot CalTrans bicycle path standard. 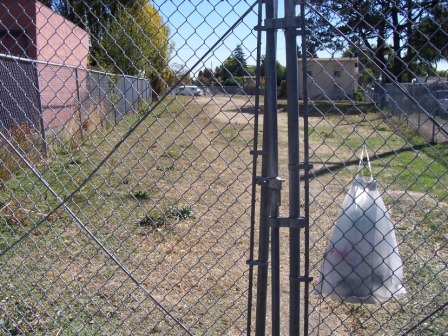 Makeshift dog park, Acton at Parker - note the odd shape of the parcel; in previous decades, ROW parcels were sold to "square off" existing residential parcels, according to Susan Schwartz. 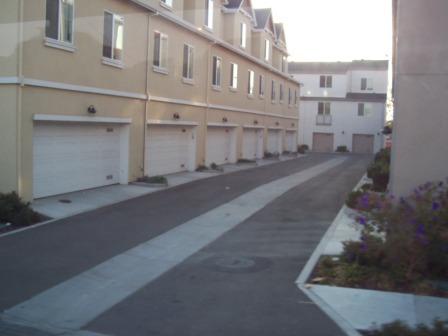 Also, in the 1980s, several low-income developments were built on ROW parcels. 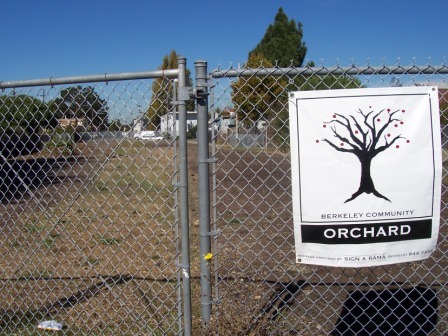 The latest Berkeley General Plan has permanently designated the remaining ROW parcels as "green space." 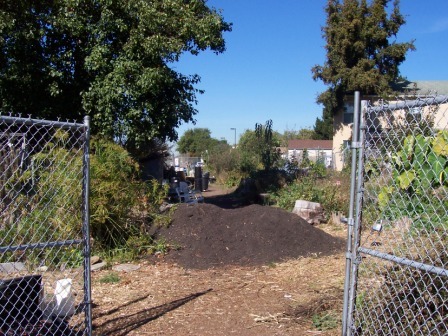 The Berkeley Youth Alternative garden founded in 1992, Bancroft Way, south of Strawberry Creek Park - note the proximity to residential structures. 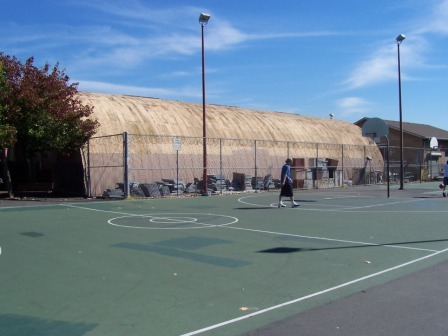 Historic quonset hut at the City Corporation Yard on Bancroft Avenue. Strawberry Creek Park was dedicated in 1983. The creek daylighting was funded by Measure Y (1974) and cost $20,000 for 1 block with "a lot of community effort" according to Susan Schwartz. The creek project at Albany Village cost $3 million for 1 block in 1998. Trail to Cedar Rose Park, north of University Avenue - note the width of the paved surface which meets the CalTrans bicycle path standard. 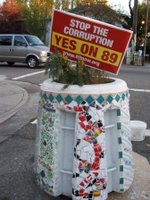 In Berkeley, Measure A, Kriss Worthington (District 7), and Mayor Bates were election winners on November 7. This news is 12 days old, but the photograph (above) was taken on Thursday, November 16, only 3 days ago. A review of local papers also tells us that election politics are still front and center. According to the 11/17 issue of the Berkeley Daily Planet, the votes for Richmond's next mayor are still being counted. The Daily Planet also reported on Oakland's proposed condo conversion policy (Berkeley's conversion policy was rejected). Today's SF Chronicle ran a feature on Nancy Pelosi's new relationship with the press as she transitions from California Senator to Speaker of the House. 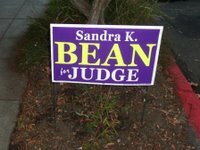 An election summary is available from the SF Chronicle. 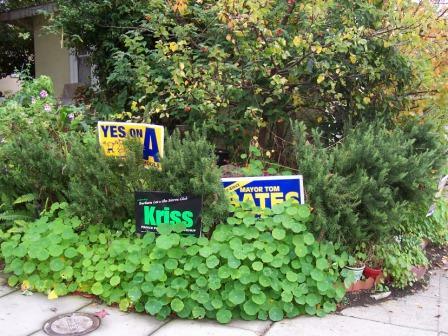 I found three new voting signs (on Fulton between Ashby and Blake). 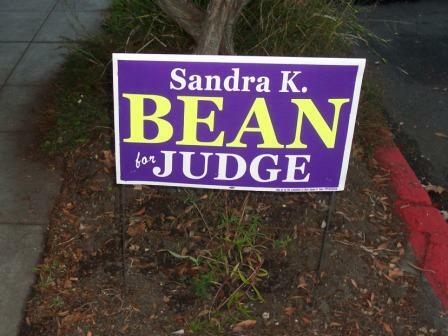 Interestingly, the judge-ship sign is in the public right-of-way. Measure J is a very popular sign on the Fulton block between Parker and Blake. 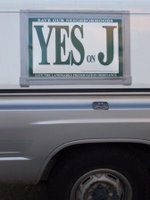 I noticed the sign in three yards and on the sides and back of a truck (see photo on the left). 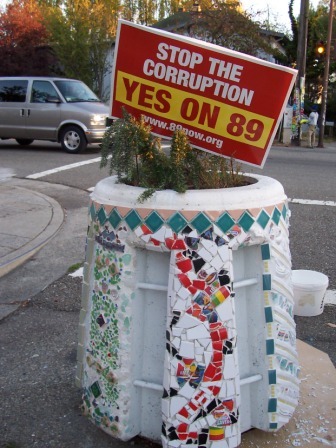 Two versions of Proposition 89. Note: In the photo on the left, the sign is in a freshly tiled traffic diverter (a future post will feature the various traffic calming devices in Berkeley). 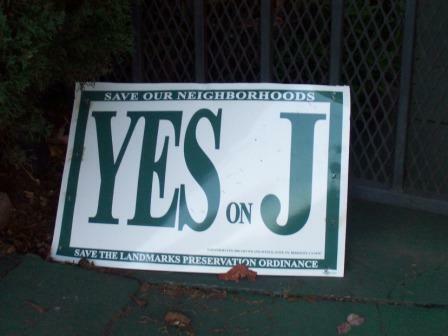 For more on voting signs, read Signs of the season...Mayors, measures, districts. 7. 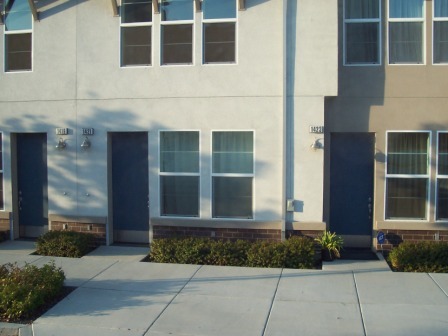 Richmond Village at BART, a new urbanist-styled development. Note the front porches (small town), flat fronts (urban), and parking courts (European mews). 8. "Tent city," one of many in protest of the high murder rate in Richmond. The domestic and vulnerable act of sleeping in urban public spaces at a time when these spaces are considered dangerous. 9. The new retail on 23rd tends to be "ethnic" retail.